North Atlantic Books, 9781623173227, 256pp. Experienced yoga instructors Sage Rountree and Alexandra DeSiato give yoga teachers the tools to find their voice and tap into innate wisdom. The authors offer ready-made, detailed themes to use in classes and provide flexible templates for building a toolkit of themes for future use. 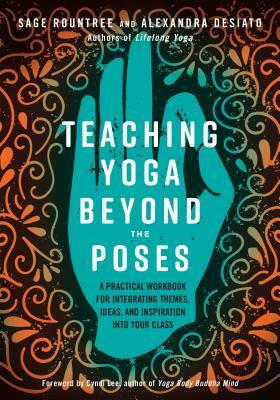 Teaching Yoga Beyond the Posesoffers guidance for both new and experienced teachers starting with a section on voice, authenticity, emulation, phrasing, practice, repetition, and finding inspiration. It continues with a second section that contains fifty-four complete themes that instructors can easily use in their own classes. The final section includes blank templates for instructors to create their own class themes and notes. With a unique angle and practical feel, this workbook will appeal to yoga teachers, teacher trainers, and at-home practitioners who want to move to the next level. SAGE ROUNTREE, PhD, is a teacher trainer at the highest level (E-RYT 500) and director of the yoga teacher trainings at the Carolina Yoga Company, which she co-owns. Rountree is the author of The Athlete's Guide to Yoga, The Athlete's Pocket Guide to Yoga, The Athlete's Guide to Recovery, The Runner's Guide to Yoga, Racing Wisely, Everyday Yoga, and, with Alexandra DeSiato, Lifelong Yoga. Her writing has appeared in and she has been cited in Runner's World, Yoga Journal, ESPN, The Atlantic, Vogue, Outside, Men's Fitness, USA Today, U.S. News and World Report, Martha Stewart Living Radio, and the Chicago Tribune. Rountree presents internationally on yoga, meditation, and athletics at venues including the U.S. Olympic Training Center, the Pentagon, Yoga Journal LIVE!, the Kripalu Center for Yoga and Health, 1440 Multiversity, the Road Cycling Summit, and USA Triathlon's Art and Science of Triathlon conference. ALEXANDRA DESIATO, MA, holds the highest accreditation of yoga teaching (E-RYT 500) and is the coauthor of Lifelong Yoga. She is an expert in yoga for healthy aging and yoga for prenatal and postnatal women. DeSiato presents and assists in yoga workshops locally and nationally, including Yogaville and Kripalu. She holds a master's in English literature from Appalachian State University, and in addition to teaching yoga classes has taught writing and literature at the college level for over 15 years.